The Avatar is an advanced construction cruiser for the Substrate. Advanced Constructor with light weapon for defense. Can build advanced base defenses. The Avatar is an advanced construction cruiser armed with a light weapon. In order to utilize the Avatar, the player must have a Gateway built and be able to afford the 108 Quanta price tag. The Avatar has light armor that absorbs up to 20% of incoming damage. 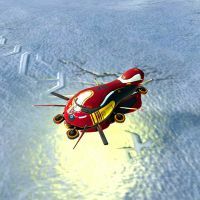 The Avatar is equipped with the same Fabrication Array and Fusion Arc that allow Constructors to repair damaged buildings and produce structures, however the Avatar is more sophisticated in that it is able to produce advanced based defences directly on the field, instead of having to upgrade basic defences. Its Nova cannon fires slow-moving projectiles of chaotic plasma that eat through light armor with ease, allowing for light defense. Fires slow-moving projectiles of chaotic plasma that eat through light armor with ease. Uses stored patterns to construct various structures or to assist in unit construction. Restores damaged units and structures by fusing repair nanites into the affected target. Avatar can only be obtained via the orbital ability Call Avatar. Avatar acts an advanced Constructor, able to construct everything that a Constructor can do, except for Technology buildings. Instead, the Avatar can construct advanced defenses directly instead of having to upgrade them through their basic tier 1 form. Avatar weapon is only effective against very light amount of frigates. Anything more than that will overwhelm it with ease. Avatar can be dropped aggressively to build proxy buildings behind enemy lines, defensively to cut the need of upgrading high amount of defenses or simply to have a constructor unit quickly at an important location.